Blake Garrison is originally from right here in Bowling Green. He is a film major at Western Kentucky University, and he will be graduating next spring. 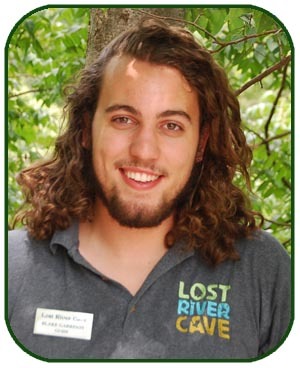 He started working as a tour guide at Lost River Cave this summer. What originally brought you to Lost River Cave? Well I heard about the job opportunity as a tour guide, and it just sounded like an exciting interesting thing to do over the summer. I could meet a lot of interesting people in the tour industry and teach them something. 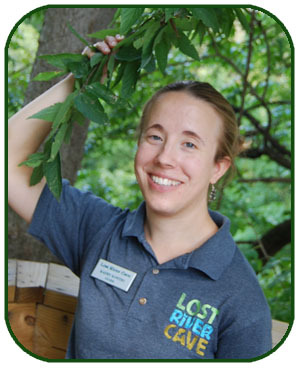 How is Lost River Cave different from any other employer you’ve ever had? Where to begin? Well it’s enjoyable first of all. When I’m here it doesn’t really feel like a job most of the time. It’s a fun job with fun people. Have your thoughts on caves or nature changed at all since you’ve been here? I’ve definitely learned a lot more about caves and cave systems. As far as my thoughts on nature in general, it’s always been my opinion that people should learn about it and enjoy it. Have you had any memorable visitors during your time working here? There was a mother and son from Lithuania, and they were memorable because I was able to relate to them because I visited Lithuania last summer. It was a “small world” situation. Have you had much opportunity to travel, if so where to? Or, where would you like to go? I have had an opportunity to travel. Last summer I took a driving trip from Beijing, China across Asia and Europe all the way to Paris, France. It was a lot more intense than I thought it would be going into it, but it was a great experience. I think everyone should try to travel more. I’ve always wanted to go to Australia and New Zealand. For visitors reading this, do you have any recommendation for where to tour/eat/explore in the Bowling Green area or all of Kentucky? I’ll start with Bowling Green: my food recommendations in Bowling Green would either be Mellow Mushroom or Buckhead Café. One of my favorite places to go which is close to Bowling Green is Land Between The Lakes. If you’re down for a trip, you can just get all your gear and just camp out right on the side of the lake. It’s amazing. Any last words of wisdom for your visitors reading this? Enjoy yourself. 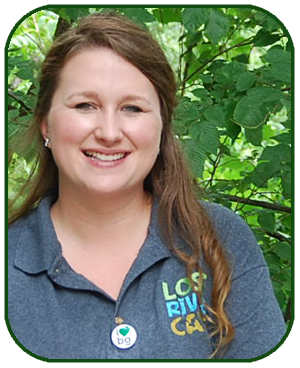 This week Lost River Cave spotlights cashier, Jessica Williams. Jessica is originally from Campbellsville Kentucky. She came to Bowling Green to attend Western Kentucky University, and she will be student teaching next semester and graduating in May. What originally brought you to Lost River Cave? I actually had friends that worked here and they loved it; they knew I was into science and education and would love it here as well. I came as a guest to view the property and enjoy what there was to offer. As soon as I heard there was a job, I jumped on the opportunity. How is LRC different from any other employer you’ve ever had? Well I’ve never had to work with a school field trip before. I’ve been on school field trips, but I’ve never been on the receiving end. There’s a lot of volunteerism and community involvement at Lost River Cave, and I’ve never worked for a place that has the kind of community outreach with the kind of things we have going on. Have your thoughts on caves or nature changed at all since you’ve been here? Well, I’ve always been an advocate for conservation and especially community education and making people aware and becoming more aware myself. Working here has provided me a personal opportunity to learn about caves, the environment where I live and different opportunities I have to improve it. Have you had any memorable visitors during your time working here? There was a family from Louisiana with 11 kids. It was like our own version of the show “Nineteen Kids and Counting,“ right here at Lost River Cave. They were very well behaved, but it was very interesting to see that large of a family. All of the younger kids became junior tour guides, it was interesting. What do you think the WORST corny cave joke is? What do you call a fish with no eyes? A FSHHHH! Have you had much opportunity to travel, if so where to? Or, where would you like to go? I’ve never had the opportunity to travel outside of the United States, and I look forward to whatever opportunity presents it. One of the career options I might consider in the future is on to teach abroad. I’m game for anything. For visitors reading this do you have any recommendation for where to tour/eat/explore in the Bowling Green area or all of Kentucky? In Bowling Green, eat at Home! It’s so conveniently located,and it really does support our local community. It’s a local restaurant using local food and local artisan-made products in the community. Eat the ham and cheese and the French onion soup! In terms of exploring Kentucky, I love the zoo. If you are going north in the state, check out the Louisville zoo, or if you’re heading south, the Nashville Zoo is fantastic. Any last words of wisdom for your visitors reading this? The cave maintains a standard temperature between 55 and 57 degrees. Danny Dressler is originally from Elizabethtown, Kentucky, and he came to Bowling Green to attend Western Kentucky University. He is currently studying Outdoor Recreation. 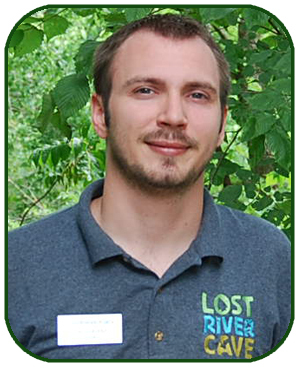 He is a supervisor, and he has now worked for almost a year as a tour guide at Lost River Cave. What originally brought you to Lost River Cave? I wanted a job that I could use as a reference for future positions in the outdoor recreation field. How is Lost River Cave different from any other employer you’ve ever had? I have a lot more freedom. I get to display my personality in my work, and I get to do what I love to do (be outdoors) all day long. Have your thoughts on caves or nature changed at all since you’ve been here? Not really. I came in with a pretty nature-oriented mind; maybe working here has strengthened my conservation efforts. Have you had any memorable visitors during your time working here? I had some people from New Zealand come and take my tour, and it was pretty cool to see people from the complete opposite side of the world come see Lost River Cave. Have you had much opportunity to travel, if so where to? Or, where would you like to go? I’ve been to India in 2009 to do some journalism work, and I would love to travel to Southeast Asia. For visitors reading this, do you have any recommendation for where to tour/eat/explore in the Bowling Green area or all of Kentucky? To eat there are lots of good places here. I would definitely recommend Mariah’s or Home Café. And while you are in the area, I would recommend checking out some of the other caves, particularly Mammoth Cave and Diamond Caverns. I would also recommend checking out Red River Gorge because there are a lot of outdoor activities like climbing, hiking and backpacking. Any last words of wisdom for your visitors reading this? I would explore the backcountry roads as much as you can. Take the offbeat path. 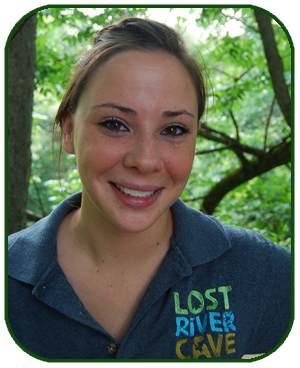 Andrea Falcetto first started working at Lost River Cave in May 2010. Andrea is currently getting her Master’s Degree in Biology and Sociology at Western Kentucky University, and she’s had the opportunity to travel to Kenya and South Africa to work in her field. She is a return Peace Corps Volunteer from Morocco, and she’s also travelled to other various countries all over the world. Andrea is originally from Kansas, and after she graduates she hopes to work for an international conservation organization. 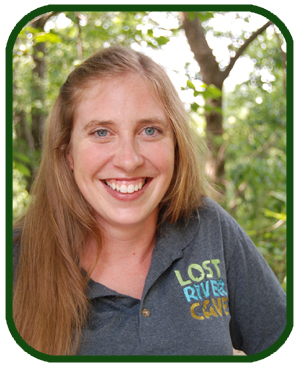 Lost River Cave appreciates Andrea’s hard work as a tour guide, and we wish her the best of luck in her future endeavors. What originally brought you to Lost River Cave? During the school year I was teaching for the biology department, and I needed income for the summer. It was a good job for me because of my previous experience working in zoos and aquariums. Restaurants won’t hire a girl who works around fish. 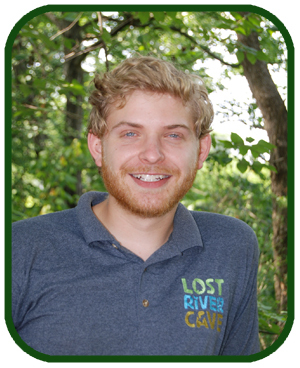 How is Lost River Cave different from any other employer you’ve ever had? I grew up in Kansas. We don’t have caves in Kansas. Have your thoughts on caves or nature changed at all since you’ve been here? I would say I’ve learned more about caves, but I’ve always enjoyed working outside. Have you had any memorable visitors during your time working here? I made a joke about a cave monster being in the cave and the three year old on my tour started making ghost noises to scare away the cave monster. It happened the other day, and it was adorable. What do you think the WORST corny cave joke is? “What do you call a deer with no eyes? I’ve no ideer.” I worked here for three years, and I didn’t get the joke until three weeks ago. Have you had much opportunity to travel, if so where to? Or, where would you like to go? I’ve travelled to six continents and would love to go to Antarctica, but the next place I want to visit is Greece. However, I am an opportunist, and I will go wherever the opportunity presents! For visitors reading this, do you have any recommendation for where to tour/eat/explore in the Bowling Green area or all of Kentucky? In Bowling Green, Chaney’s Dairy Barn and the Corsair Distillery downtown. Also in Kentucky, the bourbon trail is amazing. Any last words of wisdom for your visitors reading this? There really is a cave monster, don’t let them tell you otherwise!